China’s homo PP imports for May displayed a monthly decrease of 13% and a yearly decrease of 12%, according to ChemOrbis Import Statistics. When the overall imports conducted in the first five months of 2015 are taken into account, China imported 7% less than the same period of last year. The 13% monthly decrease in homo PP imports followed a larger monthly decrease of 27% in April. This consecutive reduction in imports can be attributed to the slower growth of the Chinese economy but more importantly to the rising domestic capacities of the country. In the case of PP copolymer, where no major capacity addition is reported, there is a monthly decrease of 7% in May imports while it is approximately the same on a yearly basis. On the other hand, imports for PP block copolymer concluded in the first 5 months of 2015 shows an increase of 16% when compared to the same period of last year. You can visit ChemOrbis Import Statistics by product and ChemOrbis Import Statistics by country to check the monthly import figures (For members only). China’s domestic PP production capacity has been growing constantly in line with the start-ups of the new coal based plants, which mainly produce homo PP. This is expected to shrink the country’s dependence on imported PP more evidently in the days to come, according to players. 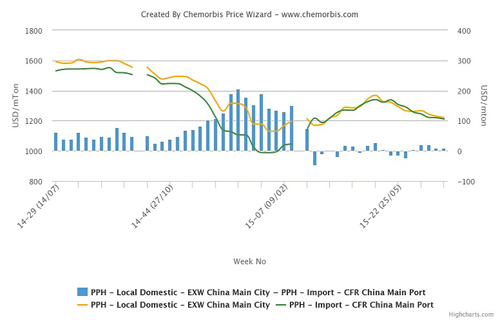 Please visit ChemOrbis Production News to check the weekly updates on capacity additions, shutdowns or restarts. Offering PP from its Middle East assets, a global producer reported reducing its allocations to China because of poor demand and more than sufficient supplies. 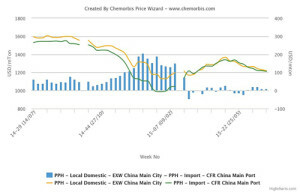 As can be seen from the graph below prepared by ChemOrbis Price Wizard, China’s local market for homo PP is trading at par or even below the import market since mid-March, when the new capacities started to come online gradually. Under balanced market conditions, the local market is expected to carry some premium over imports theoretically.